and 'The Henry Long Collection' page. The roll call of South African star riders runs through Buddy Fuller, Henry Long, Dennis Newton, Peter Prinsloo, Denzil Kent and many more, all of whom have played a part on the international scene, both in the Union and in UK leagues where they have held their own in competition against world-class opposition. The articles below were compiled by speedway journalist Christian Weber at the request of SSRC. 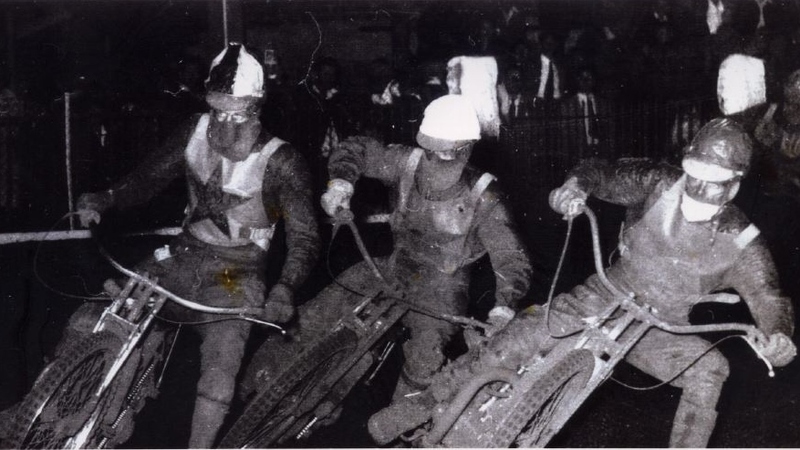 They were initially published in a local speedway newsletter around 2004, their purpose being to give the background of the sport, from the earliest days in the Union through the RSA to the present decade, to the day's generation of speedway enthusiasts. - A History from 1928 to 2003" Compiled by Christian Weber. 15: Klerksdorp Speedway keeps the Sport Alive. 28: World Champions Series in S.A.
Whilst none would dispute the role of Johannesburg's Wembley Stadium in the establishment of South Africa's post-War speedway heyday, the activities at Old Barn Speedway immediately before and after WWII must be recognized. Located a dozen or so miles south of central Johannesburg on the Heidelburg road, by 1938 local motorcyclists had constructed a dirt race track for their stripped-down machinery. A South African national championship was staged in 1939, won by Buddy Fuller, and by 1940 at least, both a quarter-mile and a 5/8-mile (1100yds) open circuit existed. In meetings promoted by US motorcycle showman Putt Mossman for solos plus midget cars, (see September programme below left,) both tracks were used during the course of one meeting, the longer for the extensive 5 mile and 10 mile,(16 lap) solo races. 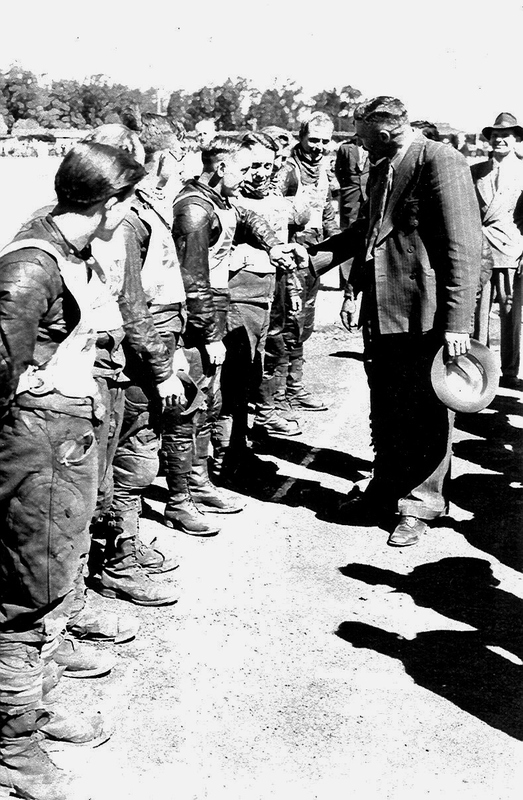 When Fuller and Doug Serrurier returned home after wartime service in Europe, where they had built bikes and ridden on army tracks in the Middle East and Italy for Forces racing, (see Warzone Speedway, Egypt,) they returned to their former Alberton site and, with other local enthusiasts that included Fred Wills, Joe Blankfield and Laurie Zeeman, built a new 700yd. track at Old Barn. The first meeting was staged in May 1946. The circuit was on open land and kidney-shaped, to give the additional challenge of a right-hand bend, and it was here that 18-year old Henry Long had his first dirt track rides, and that Buddy Fuller, the club organizer and SRA chairman (Speedway Racing Association,) claimed his second South African title. 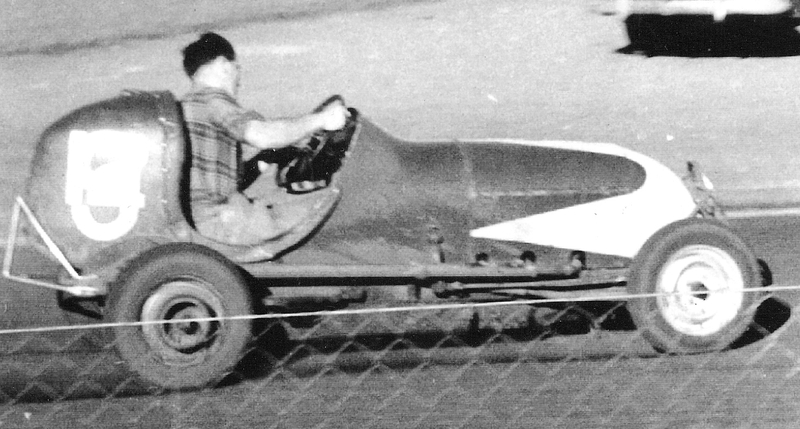 Doug Serrurier took third place, and after winning the title in '51 he subsequently went on to become a noted constructor and a participant in Formula One events in the 'sixties. August 1947 saw the last race at Old Barn. In November, Fuller took his riders to Wembley in Jo'burg city centre where, as Speedway Manager in a pukka stadium with fencing, seating and grandstand coverage, speedway was to replace greyhound racing for the next 14 years. Buddy Fuller and Henry Long are the two names synonymous with speedway in South Africa. The following pieces give acknowledgement to their careers and successes in the sport. Arthur John 'Buddy' Fuller was born in Heidelberg, 30mls south of Johannesburg, on 13th January 1916, moving to Joburg as a teenager. Bought a 500 Norton by his father, at age 19, he took part in his first DJ Run, (Durban-to-Johannesburg,) but made his mark in speedway, debuting at the Old Barn Track near Alberton in 1938. 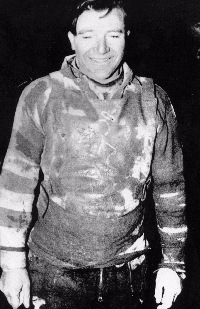 He won the Harlequins Club's championship, the Diamond Shield, in 1939, and in 1939/40 took the South African dirt track championship at the Old Barn, retaining the title there on the rebuilt track in 1946. Buddy raced with 350cc and 50Occ Nortons at all the major events in the country. His greatest success in this sphere came in 1942 when he scored a double '350-500cc class' scratch race win at the Waverley tar circuit near Pretoria. Having worked as a bus driver, during the war Buddy Fuller signed up with SA Air Force as a mechanic, with tours in Madagascar, Egypt and Italy. In Italy he built dirt track bikes from parts for Sapper speedway meetings that he also took part in, and when hostilities ceased, rode 1,750 miles across Europe in 11 days to reach Britain. Back in SA, Buddy won his Springbok colours in 1948 in the speedway Test Match series against England, the first of what were to be 23 representative appearances for South Africa, 13 as captain. Buddy was instrumental in introducing speedway to Wembley Stadium in Johannesburg in 1948, where he claimed a third national title that year. He also became founder and Chairman of the African Speedway Riders’ Association. On the track, Buddy remained at the forefront, but riding for the Hastings Saxons in the UK, he crashed in one match and was struck by a following rider, suffering a fractured skull, broken jaw and partial paralysis of the right side of his face. Unconscious 3 days, it took him a year to recover: doctors recommended that he retire. Buddy decided otherwise. As well as motorcycle speedway, Buddy was instrumental in 3- and 4-wheeled speedway. He introduced stock car racing to South African in 1955 and drove regularly. In 1956-57, Buddy launched his 'Cavalcade of Speed' comprising speedway, stock car racing and stunts at venues countrywide. The stunts led to the formation of the Hell Drivers stunt troupe. His 1959 “Buddy Fuller Motor Variety Show” at Wembley was a combined speedway and stock car show, with a Jnr. and a Snr. South African speedway championship, (won by Henry Long.) Staged in conjunction with the Rand Daily Mail, it included their 'Man v Woman' driving competition to win a new car. Buddy became founder Chairman of the South African Hot Rodders Club, and with Wembley tarred over he imported American V8 sprint car racing in 1966. Buddy also became involved in drag racing, imported a dragster from the UK in partnership with Brian Murray, with whom he formed Fulray Racing. As interest in solo speedway returned he ripped up the tar in 1972 and invited over riders from the States for full SA v. USA Test Match series in the '70s and '80s. Buddy introduced modified saloon oval track racing and Australian side-car speedway to South Africa, with test matches against British teams, and even held the first Supercross race in the country, in New Kingsmead, Durban in 1986. Buddy Fuller continued to stay involved in motorsport through the 90’s, first running the Brakpan oval and then becoming involved in a revival at the new Wembley Oval. Buddy Fuller died aged 89 at the WITS Old Age Home in Johannesburg on May 9th 2005. A memorial service was held at the Doves Chapel in Braamfontein on May 11th. After the service, oval track enthusiasts transferred to the Wembley Raceway in the south of Johannesburg to witness Laps of Honour by sprint cars and speedway riders. As per Buddy's wish, those attending, - many as seen in the photo below - , partook of R1,000 worth of beverages for free, - a 'one last drink' on Buddy! 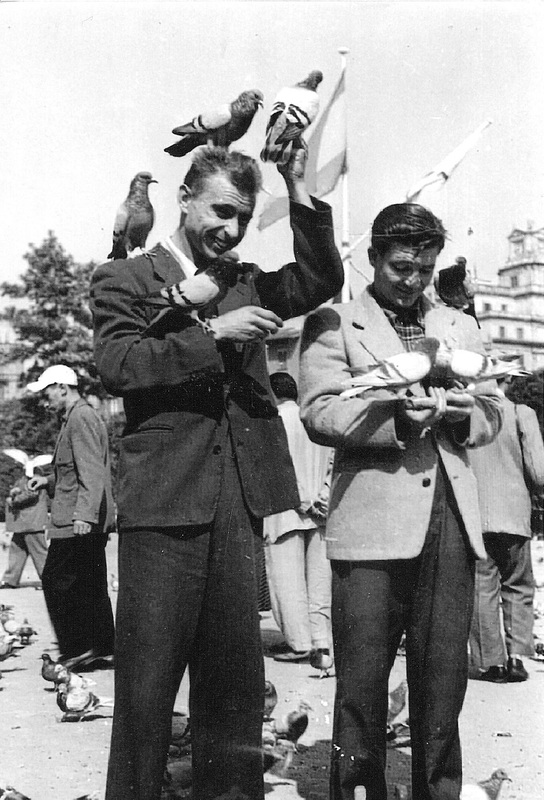 Lt.>Rt: Dudley Bekker, Dennis Newton, ? , Fred Wills, ?, Colin Aitken, (4 unknown,) . . .
. . . Noddy Naude, Boet Strydom, Henry Long, Arthur Bruins; knlg Denzil Kent. 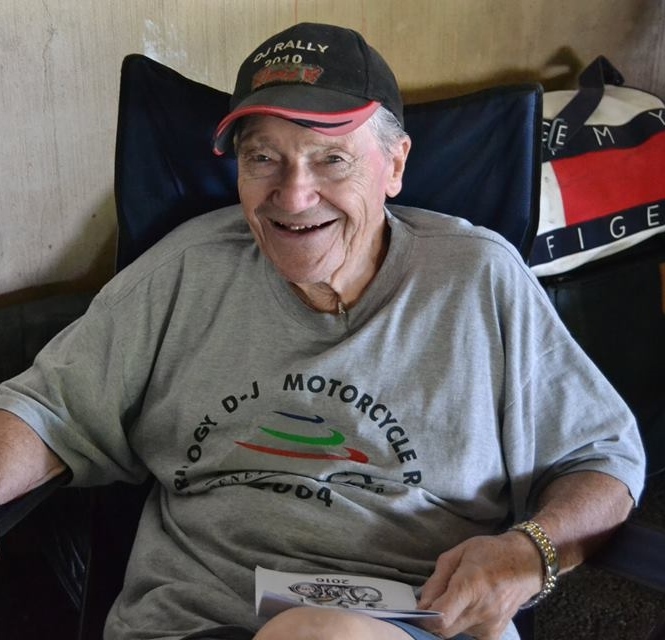 Henry Long, South Africa's most successful speedway rider, had his first rides on a dirt track at age 18 when the Old Barn track at Alberton was dug out and re-opened after the war. On a 350cc Levis, (as seen below right,) he competed in Harlequin Club competitions controlled by the nationally-affiliated Speedway Racing Association, against the likes of Buddy Fuller, Doug Serrurier and Fred Wills, who'd each ridden the old venue before enlisting in WWII. At this point in time equipment was in short supply, - only the aforementioned trio owned JAPs. Not withstanding, the programme notes of Dec. 7th 1946 said of No.25, Henry Long: “A desperate young rider with great ability and courage, …. one of the most popular riders today. A great future may be in store for him.”. For the 1947/48 racing season, with the arrival of more JAP speedway bikes into the country and the riders' club transferring to a new venture, Johanneburg's Wembley stadium was to become the Mecca of speedway in the Union, hosting international Test matches and national championships. Henry was a regular competitor there from the onset, and became a Pretoria Buffaloes team member when league racing as a 4-team competition was established, - all 4 teams, Johannesburg, East Rand, West Rand plus the Buffaloes, staged their matches at Wembley. With Buddy Fuller gaining a team spot in the Hastings side for the UK summer, Henry ventured abroad too and had a dozen matches for Division 2 side Sheffield, impressing enough to be given outings with the famous Belle Vue Aces of Manchester in the following 1949 British season, the offer having been strengthened by his outstanding performances in the first post-war SA v. England Test series, when he top-scored (across both teams) with 51 points in the 5-match series. 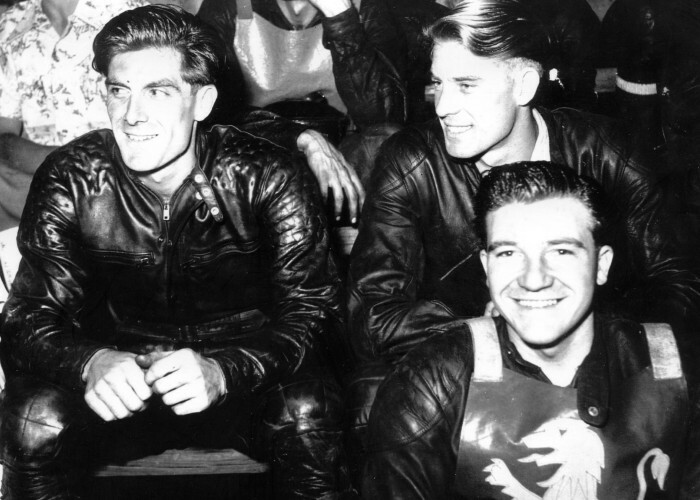 At home Henry Long proceeded to dominate Friday nights at the Wembley circuit throughout the 'fifties, having settled his dispute with the SA.SRA, (now the Speedway Riders Association,) and having replaced Buddy Fuller as captain of Wembley Lions, - as the Jo'burg team had come to be re-named - , in 1953. The exception to that was his penultimate season, when he skippered the Durban Hornets under the sport's re-structured body, the NSU (National Speedway Union,) formed following South Africa's most disruptive speedway dispute in '56/'57. In Test matches during this period he invariably topped the Union's score sheet with double figures, (seen above dicing with Barry Briggs in the 1st S.Africa v. British Commonwealth Test of December 1954: full details to be found on the 'SA Test Match' pages.) In 1952, after winning his first and much-delayed SA Championship, - delayed because of, respectively, engine failure, a banning order, and Belle Vue duties - , he achieved the ambition of all speedway riders by reaching the Final of the World Championship held annually at Wembley Stadium, London. Only one other S.African rider, Doug Davies in 1956, can lay claim to having emulated the feat. Along the way Henry Long won 7 SA national championships, (including the SA Open and the SA Handicap Championships,) and was End-of-Season Golden Helmet Match Race Champion 5 times, going undefeated throughout the 1955/'56 and 1956/'57 seasons. After control body disputes in the late 'fifties and South Africa's withdrawl from the Commonwealth in 1961 international speedway in the new Republic was minimal and so were Henry's appearances: he retired finally in 1962 and lives presently (2019) in Western Cape. trophy and Runner-up Roy Bester. i) 1947 - 1959: Transvaal League, National League. In the post-war heyday of South African speedway, league team racing was introduced, first in the Transvaal, then wider as a National League. In later decades other small scale leagues were initiated, though not all ran to conclusion. The attached article and appendices, and accompanying tables summarize the teams and the tracks of each year, with the concluding result. Posted here is an A-Z list with accompanying summary article of more than 80 speedway tracks that have staged dirt track motorcycle speedway racing in South Africa since the inception of the sport in the late 1920s. 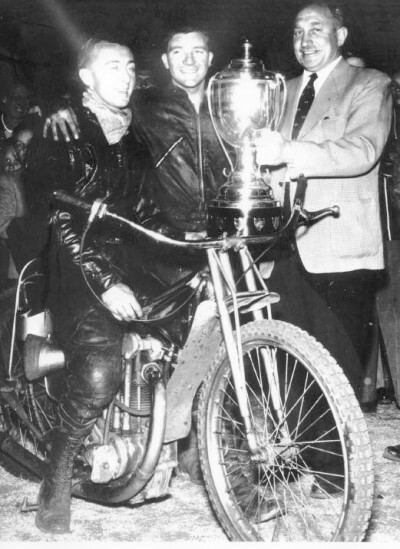 Many Southern African-born speedway riders, including a number from the Rhodesias, traveled to Europe to race in the UK's domestic leagues and improve their racing standard, perhaps even to reach a Wembley, London World Final and realise the ultimate dream of every speedway rider to becoming World Champion. The accompanying table and its brief review lists these riders. and many more can be found in detail here. In 2005 the disbandonment of the NSA (National Speedway Assoc'n) resulted in two camps, - SSRC, (Southern Speedway Riders Club,) encompassing Walkerville/Glenvista, Rustenburg, Wembley and Kimberly,) and TVSC (Thunder Valley Speedway Club,) at Brakpan - , taking entrenched positions and operating independently of each other in the following season. 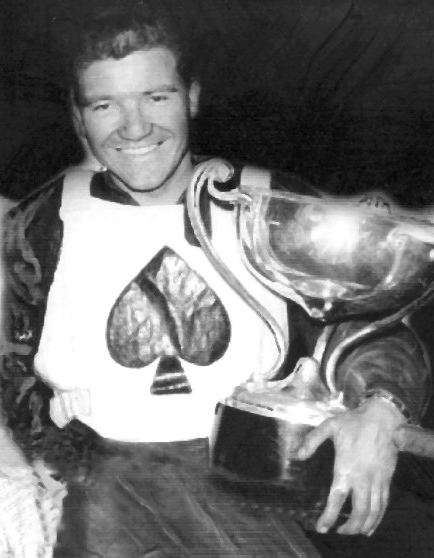 Peter Williams was a member of the UK's Belle Vue Aces team when he was invited to join the Johannesburg Wembley Lions for a season in the Union alongside his one-time Aces team-mate Henry Long*, the Lions' skipper, for the 1956/57 season. After 56 years the two have recently (June 2013) been in touch again by 'phone, recounting old times, thanks to 'Speedway South Africa' reuniting the pair, which prompted PW to dig out some old photographs of the day, now to be seen on the Gallery p.1: 1946-60 page, (scroll down.) They include formal line-ups of the Springboks and England test match teams that season, when the pair were on opposing sides, plus informal snaps taken at Wembley and as riders of the day moved around between Jo'burg, the Cape and Southern Rhodesia. * Henry Long: His full career biography is presented here. Dave Collins has the rare distinction of having ridden in speedway Test Matches for both South Africa and for England, having started riding speedway in the Union but being UK-born. These included both sides of the 1956/'57 series after England lost Alan Hunt and he was re-allocated from the SA squad to the visitors team. 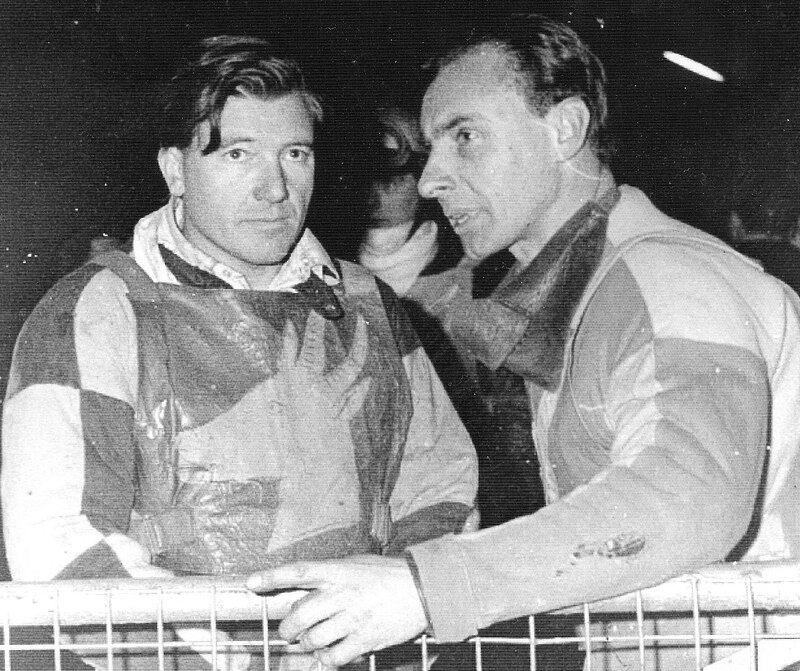 He had winter spells in Europe during the '50s and '60s, riding in Holland, France, Spain and Gt.Britain, and he captained the winning England side in an unofficial 3-match series at Goodwood Showgrounds, Cape Town, in 1967. 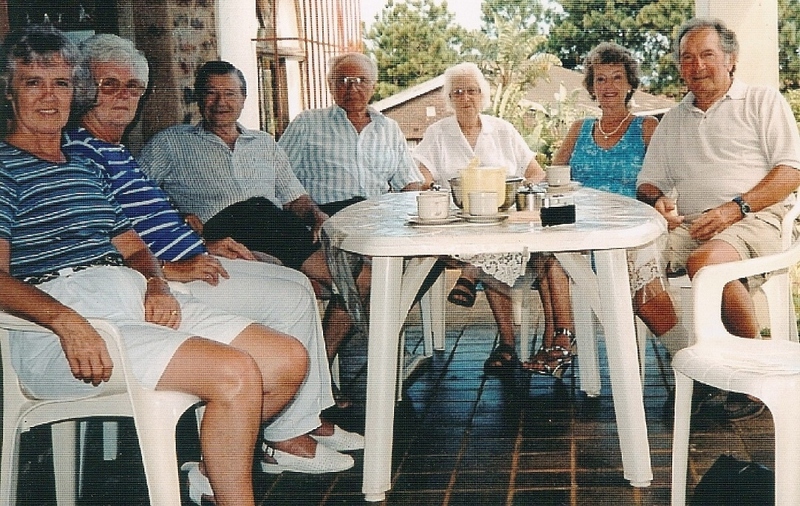 Now at 89, (in 2016, - see final s/show image,) Dave Collins lives in Munster, KwaZulu-Natal. The attached article follows from an interview a few years ago by British speedway journalist John Hyam, and published jointly here and on the Defunct Speedway website in August 2015. 1: Collins, left, in the England line-up of the '49/50 Test Series. 2: As a Randfontein Ace, collecting the Bloemfontein Trophy there, Sept.19, 1954. 5: Dave with the Williams brothers, - World Champ Freddie, and Ian - , in the Wembley pits, 1953. 6: 1954 action at Wembley Stadium, Johannesburg: - 'Springs Stars' Toy Edwards and Dave Collins against Freddie Williams. 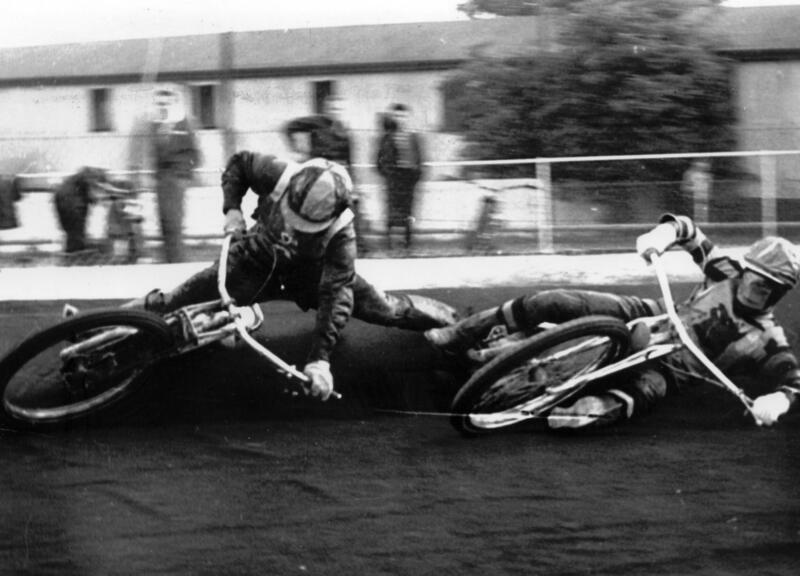 7: UK action at Wolverhampton,1964, - Dave Collins, left, then with Sunderland, tangles with Wolves' James Bond, right. 9: in the Rayleigh UK pits, 1964. 10:1970 - Dave Collins tests a midget car at Wembley Stadium, Johannesburg. 12: Latest shot of Dave, 2016, age 89.